Change Interval - by default, the interval of skipping a record is one (1). It can be set on the PEM, Others tab into greater number but then you will be stuck up on that fixed interval. So I decided to give users the capability to change skipping of number of records at their whim, and so this. Jump To Record - is requested by a subscriber after I updated them yesterday. This allows you to specify the record number to jump stright into that. 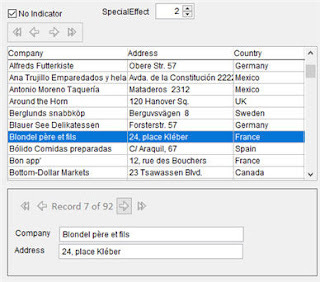 Set Filter (available only when bound to Grid) - allows you to filter grid records on-the-ply. Remove Filter (available only when bound to Grid) - as the name implies, remove the filter that you set above. It now forces you to click on a target column first before it allows filtering. If you haven't, it will give you the message 'Click on a Column First' which cannot be selected too. In the above image, I clicked on the header of column for Company. 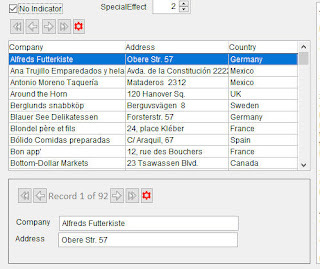 Please note that when it says Set Filter to Company, that company there is the underlying field used by that column and not the column header's caption. That allows the users to realize too where they are performing the filter. However, I remember that not in all cases, a filtering feature is good because there might be cases where there is already a filtering implemented in a grid and if we use this class filtering capability, then it can overwrite the filter condition which you guys set by codes. And so for cases like that, I added the NoFilter property. Set this to .T. and it will not show that filtering capability anymore. 1. BackColor, BackStyle, SpecialEffect, BorderColor, and BorderWidth. 2. Hover Effect. Cousin Glen suggested an idea to show the border of the class on Mouse Enter. I like it so I added it here as well. To make the effect look better (at least to my taste), I changed SpecialEffect to zero as default. So now when you move your mouse on top of the class, it is suddenly raised and when you move away from it, it goes back flat and borderless. Some more ideas may come to me in the future about this class or some may be suggested by others. We will see. NavigatorX is a new control class that handles record navigation like going to top, previous record, next record, and going to last record or bottom. I was browsing for some things on the web when I saw again a Paginator (Page 4 of 24) and I said to myself, well this looks cool to be added to ssUltimate Library? But since we are not dealing with pages inside VFP as we have grid, then it is best known to us as a navigator. 3. As for that Record Indicator, you can control its appearance by using any of these 3 properties, i.e., FontName, FontSize and FontTop. For the appearance, you can further change Backstyle, Borderstyle, Bordercolor, etc. 2. On Form Init event (I prefer this event to ensure everything is already instantiated such as the needed recordsource), bind it to the controls you want refreshed. Said controls should be bound via ControlSource or RecordSource where a simple Refresh is need to show the changes made. And that is it! This is now officially part of ssUltimate Library. Very nice class! more power to you Sir Jun! Thank you Matthew. I am still adding new features to it as of this comment so I suggest that you guys check this post now and then because I am giving this more power. Cheers!